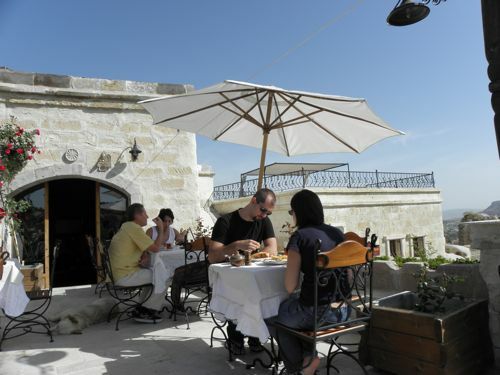 It goes without saying that Cappadocia is beautiful. But it’s more than that. It’s sicak (see-JOCK) in Turkish, which means warm in temperature—and in temperament: amiable, accommodating, and agreeable. I was unsuccessful at finding a travel companion, so I went alone. Not big on solo travel, I hoped to keep myself busy enough to evade loneliness. A camera is a reasonable (though not particularly chatty) companion. After sweating out traffic delays on the way to the airport (a long 3 hours en route from my apartment), I checked in with only moments to spare, then waited out a two-hour flight delay. Wouldn’t you know? I was met at the Kaiseri airport by a thunderstorm and a driver. Whew! 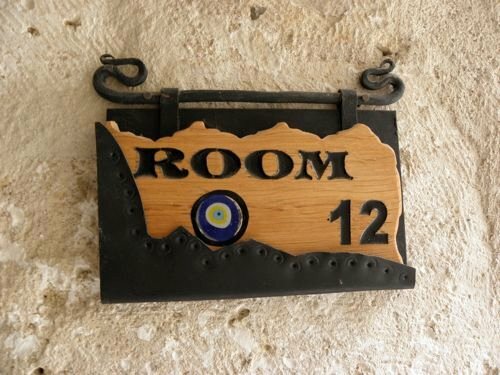 When I finally arrived at the Kelebek Hotel, a familiar friendly face welcomed me and showed me to room twelve (charming), where I collapsed into a deep sleep. Even the numbers are charming. I’m not going to recount my entire weekend, as it’s a bit redundant. (Took pictures of this, took pictures of that…) What I’d like to share, though, is the warmth I was met with. 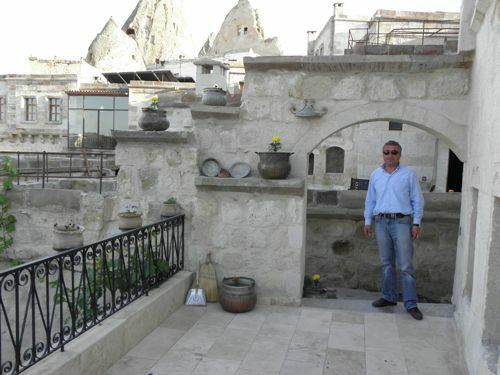 This was my fifth trek to Cappadocia, and I’ve always stayed at the Kelebek. It’s expanded considerably over the past five years, but its warmth and personalized service continues undiminished. I felt like I’d come home. Hasan’s gravely voice and welcoming smile lift my heart; with unassuming demeanor, he offers his service before you even think of a need. It’s lovely. “You can check in when it’s convenient—any time.” How many hotels offer you that? I spent the night, enjoyed a leisurely breakfast, and was sitting on the side porch with a cup of coffee when Alta (a new employee) brought her clipboard out to check me in. I didn’t even have to step into the office. 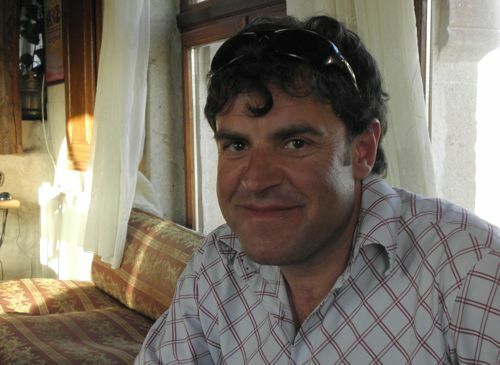 I asked if Mehmet and Ali, the hotel’s owners were around, but they were out for the day. I’d catch them for photos later. I headed off with my camera to visit two local women outside of town. They live in cave houses and welcome visitors to see their homes, chat, and share tea; then they uncover needlework they have for sale. Most of it they craft themselves during the long winters, although some of it is purchased. As I walked up the road, a little girl called out, “Anne anne, bayan geliyor!” (Grandmother, a lady is coming.) Then in English, she said, “Come to see my grandmother.” Little did she know that’s exactly what I had in mind. I interviewed Hatice (hot-EE-jay), a woman about ten years my junior with an interesting story. 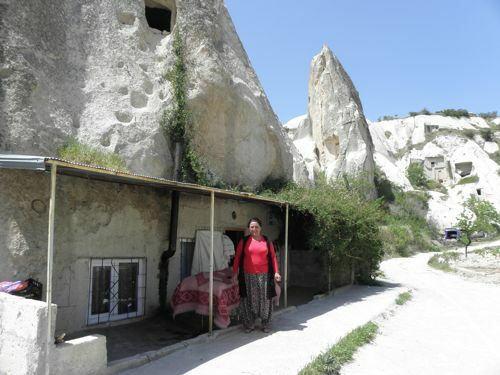 She grew up in Göreme, where she attended eight years of school, then married at 16. She was married for thirty years, then divorced, choosing to stay in her cave home and support herself with her needlework. “I don’t need much,” she said, “and I am happy here. It is a quiet life, but a good one.” She showed me a few of the 28 rugs she’s made, but she said that she no longer makes them. She prefers to embroider and make oya to trim scarves. She encouraged me to stay and visit longer, and though I was tempted, I needed to head out. My next visit was with Fatma, a woman just around the next fairy chimney. She’s my age mate (60) and has beautiful white hair, a rarity in Turkey. 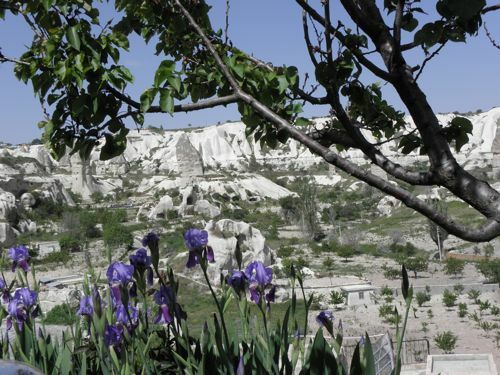 I was told by a Turkish woman that I should let my hair grow long and dye it black, and since then I’ve noticed that nearly all Turkish women dye their hair, even in Göreme. At any rate, Fatma met me with a beautiful smile and removed her scarf to rearrange it before I snapped any photos. 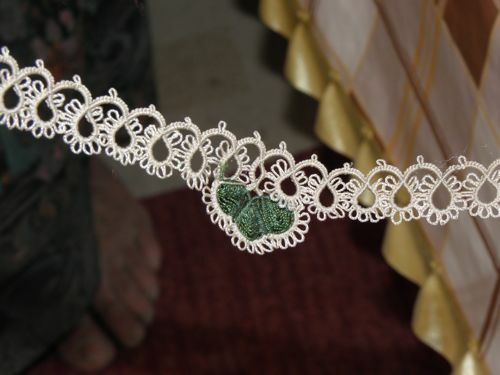 Fatma’s white scarf is edged in lovely bead oya, lacy trim intended for scarves, though it’s now often transformed into jewelry. Fatma never attended school because her grandfather felt that it wasn’t necessary for a girl to be educated. Her sons taught her to read as they learned, though she says she’s very slow. 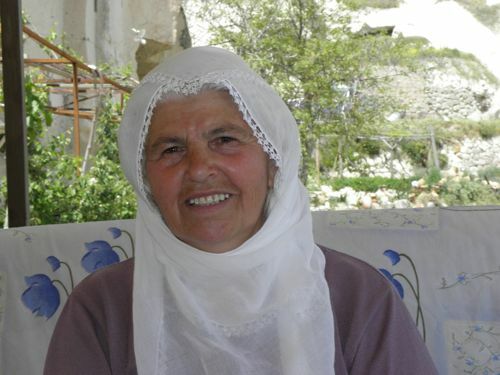 Fatma and her husband live in what was her father’s home, and they keep a vegetable garden for the family, replete with tomatoes, peppers, onions, and the like. They also tend five more gardens away from their home, mostly grapes for raisins. Fatma invited me into her home for tea and cake. Her walls and floor were covered with rugs, either gifts or her own work. 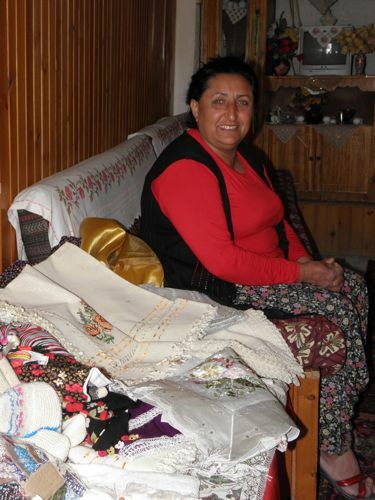 Because her sight has weakened, she no longer makes rugs but spends her winters doing needlework. She said she’s made more than 40 carpets over the years. The one hanging on her wall was a work of art. Age mates posing before a Fatma masterpiece. I’m afraid I’ve gone on too long. 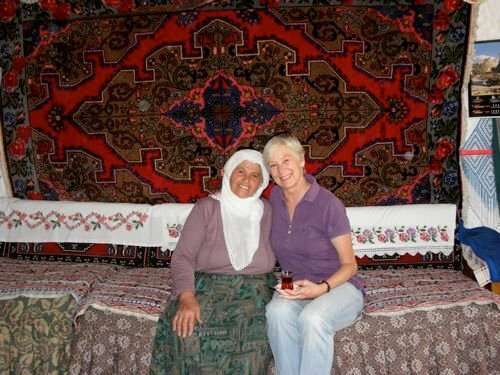 These ladies welcomed me, as did Ruth at Tribal carpets, Şemse at Sultan’s Carpets, and Mehmet and Ali, the owners of the Kelebek. These kind people warmed my heart and made my weekend a delight. Ali (in spite of miserable allergies) gave me a tour of the the new cultural center they’re creating (the focus of my upcoming article). 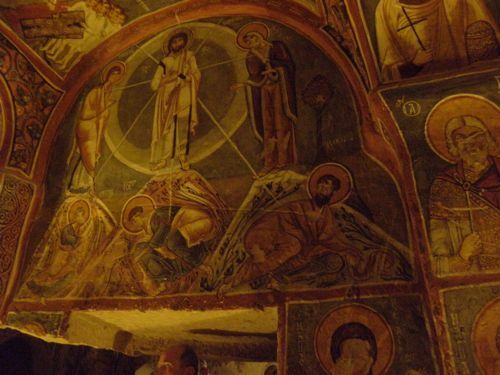 I was also treated to a fascinating tour of the Open Air Museum–amazing underground churches carved out hundreds of years ago, guided by Mustafa, an incredibly knowledgeable young man. Another Kelebek connection that far surpasses expectations. 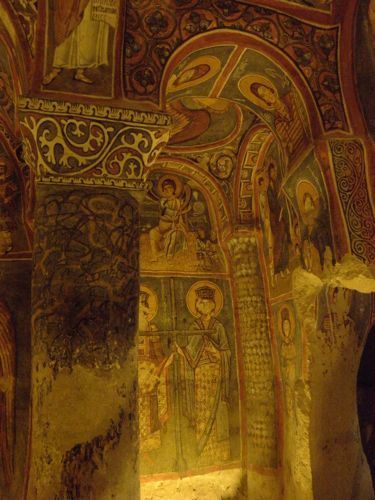 Another wall in the Dark Church–amazing! 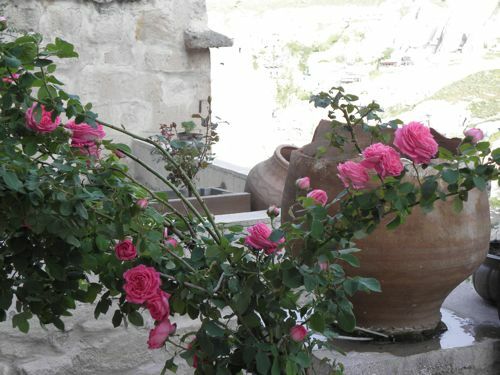 I just want to stress once more that everyone in Göreme welcomed me warmly, from the soft-spoken room cleaners to restauranteurs, shop owners, and hotel staff. In fact, as I visited numerous hotels for my article, everyone was more than accommodating—except at the most exclusive hotel. This is a nice place. I get so enchanted with its beaty. How I wish to be here soon. This site gives good credit to the beauty of its place. I would like to know if there is fee or any entrance fee in coming in to some of the spots? Hi Anne. Turkey is a beautiful place. It looks like you had a great time. Where else do you want to travel? 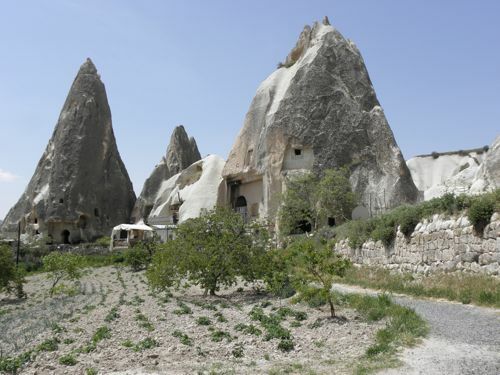 I just returned from the Cappadocia region and loved seeing your post, especially the oya.